July 30, 2015 (LBO) – Sri Lanka’s total outstanding public debt including debt taken by state enterprises was 7,959,939 million rupees as at the beginning of the month of July 2015, cabinet spokesman Rajitha Senaratne said. 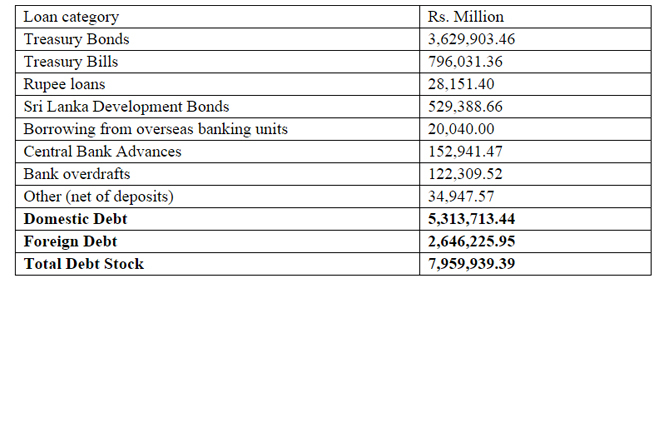 Treasury Bonds stands at 3,629,903 million rupees where as treasury bills was 796,031 million rupees. Domestic debt was 5,313,713 million rupees while foreign debt stands at 2,646,225 million rupees.